My sweet husband came home from work a couple weeks ago and said, "Mind, can I ask for a belated birthday gift, or early father's day gift?" In my head I'm thinking...oh no...he's found some electronic devise or camping item that he wants to buy. That's never a good sign for out savings account. So I braced myself and dared to ask, "what is it?" 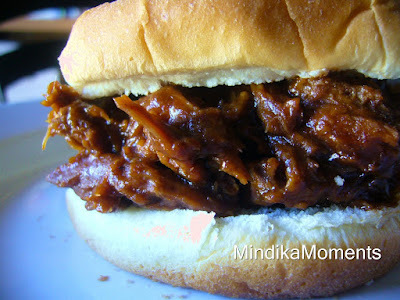 But to my amazement all he wanted was for me to make shredded BBQ beef sandwiches for dinner one night the next week. Along with my relief, I felt a little sadness...my poor husband thinks a request for his favorite meal needs to be a part of some birthday or holiday gift. Where did I go wrong...or where did I go right?? Well, needless to say...I gladly fulfilled his request. What can I say, my husband really enjoys a good BBQ sandwich! I hope you do too. 1. Rinse and dry your roast. Place it in a large crock pot. Season with salt and pepper. 2. In a mixing bowl combine the rest of the ingredients. Pour over the roast. 3. Cook on high for 3-4 hours or on low for 4-6 hours. 4. When the roast is done, remove it from the crock pot and shred. Return the shredded beef to the crock pot and mix into the juices. 5. Allow to cook for an additional 30 minutes with the lid off. 6. Serve on buns or over rice. *This recipe would also work with a pork roast or even chicken. Yum! I might just request the same thing from my wife for Father's Day after seeing this delectable sandwich. Good call on posting this one, Mindi. And good call Mindi's-husband for appreciating a good BBQ beef sandwich!